icci is accompanied by his little son Bruno who initially shared his father’s pride when he set off to work in his brand new uniform and now bears the burden of the bicycle’s loss. It is this relationship between father and son that forms the crux of the film. So obsessed with his quest does Ricci become that he is oblivious to the struggle that Bruno has keeping up with him. At one point, he even slaps the child causing the young boy to retreat in tears. In a fascinating DVD extra documentary, De Sica is also seen slapping the kid in preparation for a later scene; “Cry, Enzo. Cry!” he commands. And it works. The camera zooms in on his distraught face and we in the audience feel the tears prick our own eyes. Enzo is later rewarded with some candy and everything is fine. De Sica had been a matinee idol in the fascist era of the 30s and knew what it took to get a good performance on screen. 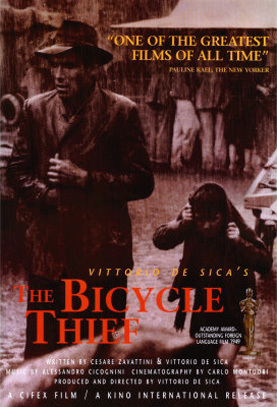 It’s doubtful that this kind of direction would be acceptable today but by using it back then on non-professional actors, the Italian director won an Honorary Oscar for Best Foreign Film and created what has become widely regarded as a masterpiece of neo-realist filmmaking.